Our caffeine-free African Honeybush (I know this is two Honeybush blends in a row, but I couldn’t resist), blended with dried pineapple and just a touch of freeze dried cherries and natural flavors. We’ve included the natural essences of cake, pineapple, brown sugar and even a hint of maraschino cherry to top it all off. This was the tea of the week for the week of April 19, and as I am writing this, there are 15 pouches left of this fabulous flavor. As someone who has tried many of their flavors, I can attest that this is a company that does honeybush blends right! This tea is absolutely decadent and delicious – a perfect substitution for dessert! Pineapple upside-down cake is more than just a dessert; for me it’s like comfort food. That yummy, caramelized crust of brown sugar, pineapple slices and cherries. The rich, buttery cake. A slice of pineapple upside-down cake is a little bit like a slice of paradise! In the meantime, I can indulge my taste buds in this dessert in a teacup from 52Teas. And they nailed it with this blend! The dry tea smells quite delicious – I can smell the pineapple and I can even smell the buttery cake. My mouth started watering when I first opened the pouch! I could hardly wait for the eight minutes to pass while it steeped! I wanted my pineapple upside-down cake! The honeybush base is perfect for these flavors. It is sweet and honey-like, with a pleasant nutty taste, but it is not overly assertive in the blend and does not interfere with the buttery cake-y, pineapple-y, caramel-y, kiss-of-cherry flavors. After my initial sip, I chose to add just a sprinkling of raw sugar to bring out some of the finer details of this tea. It does have it’s own sweetness so just a little bit goes a long way here. Next time, I might add a little bit of muscovado sugar to bring out some of the more molasses-y caramel notes. That being said, if you are one who prefers not to add any sweetener of any kind to your tea, this tea is still quite delicious without the addition. 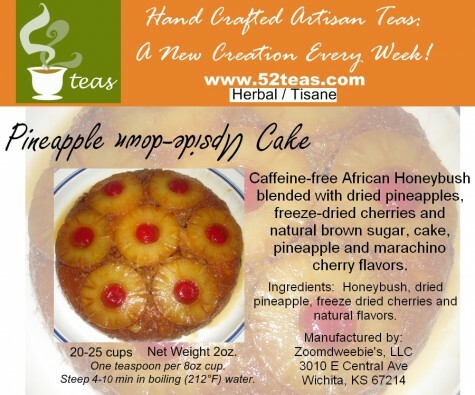 This is truly a lovely way to indulge in the comfort of pineapple upside-down cake!